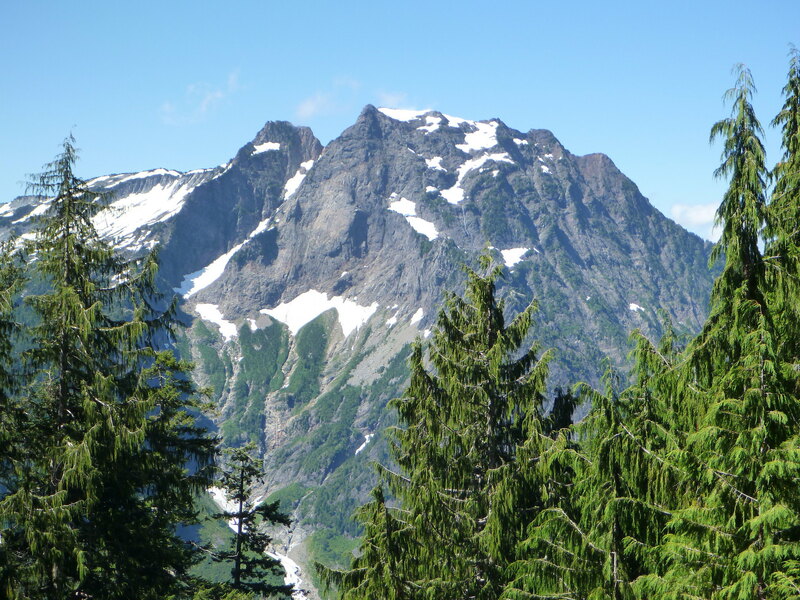 Vesper Peak is located in the Mountain Loop Highway area, in the southern part of Washington’s North Cascades range. The area has fascinating geography. 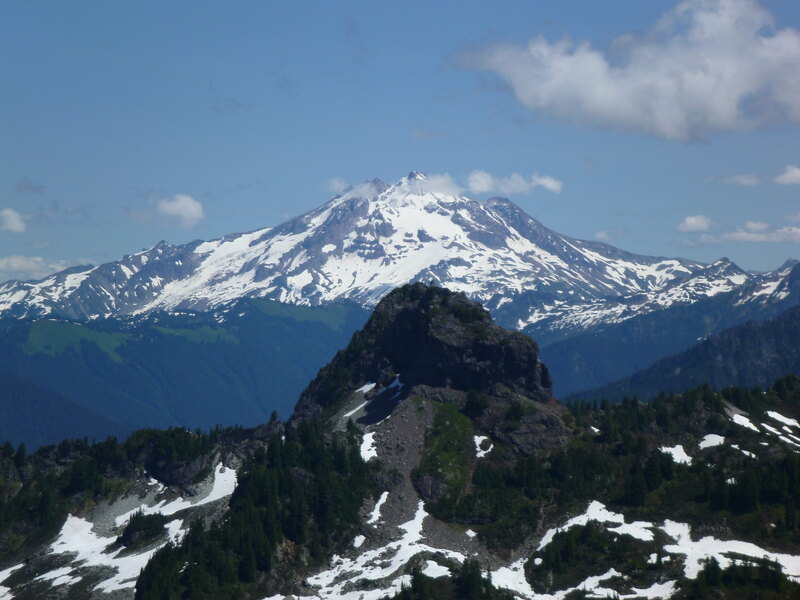 A far cry from the crumbly, volcanic rock often found elsewhere in the state, the MLH peaks often expose large granite faces perfect for technical rock climbing. 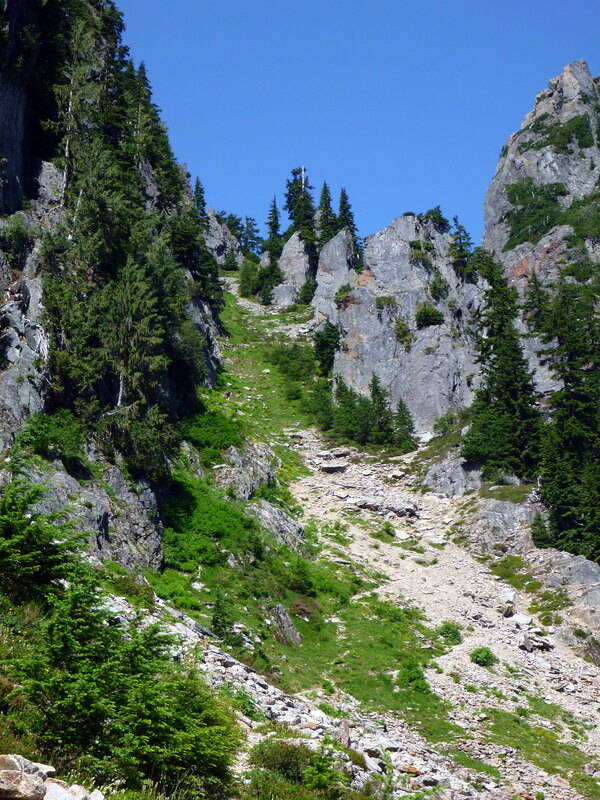 That was not our objective today: we were happy with the normal hiking route. 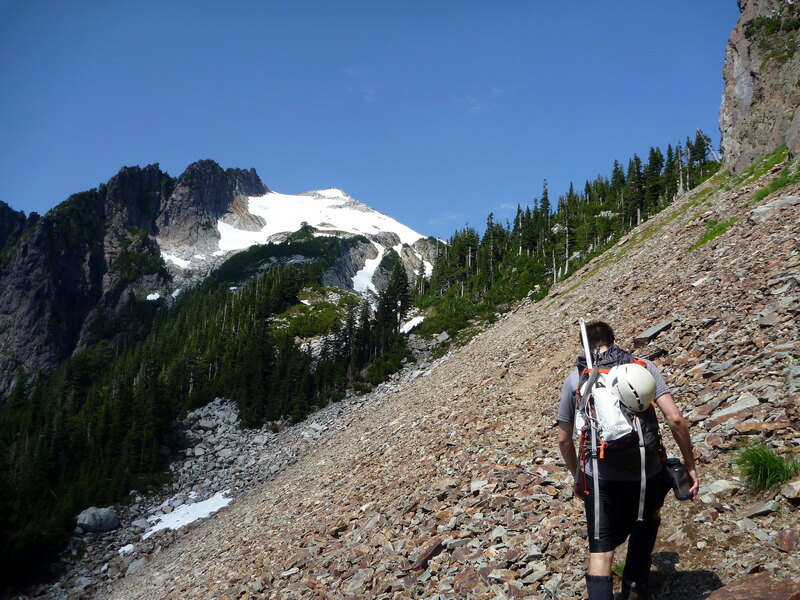 However, in typical Washington fashion, we knew to expect snow in the upper reaches of the mountain, so we came prepared with ice axes for steep snow and helmets for a couple areas of loose rock. The helmet was probably not necessary, but we were glad to have the axes in several places. 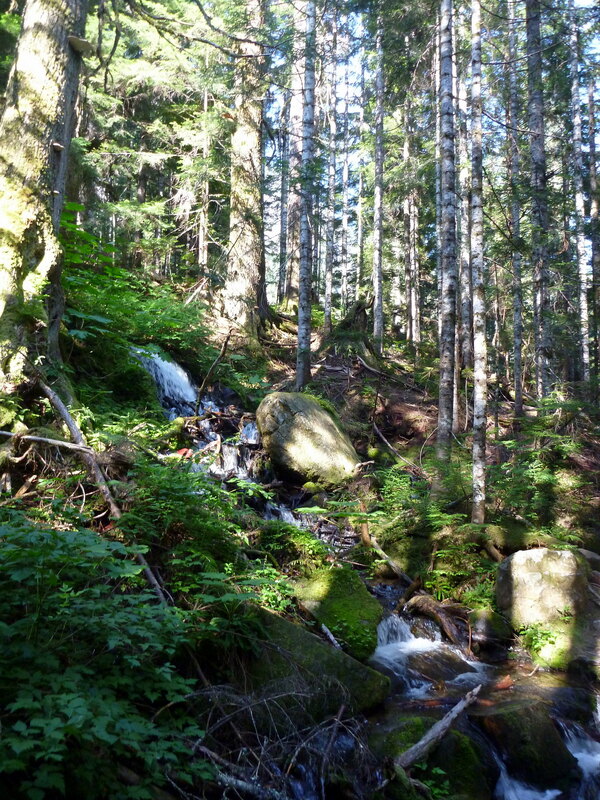 The hike starts out at the end of the Sunrise Mine road, and passes through a lower stretch of forest with several lovely creeks and rivers. The Stillaguamish River crossing was no problem at this time of year; we crossed with dry feet. 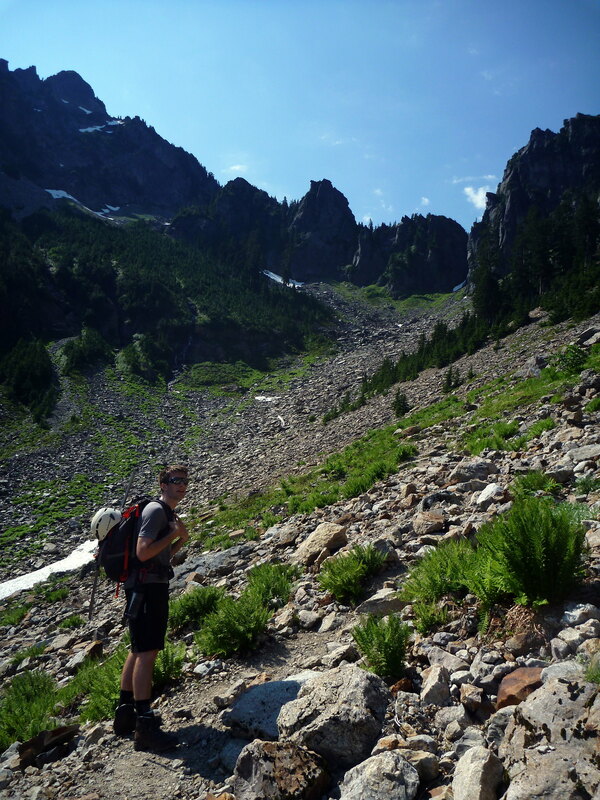 The next portion of the hike criss-crosses the scree and talus field of Wirtz Basin. 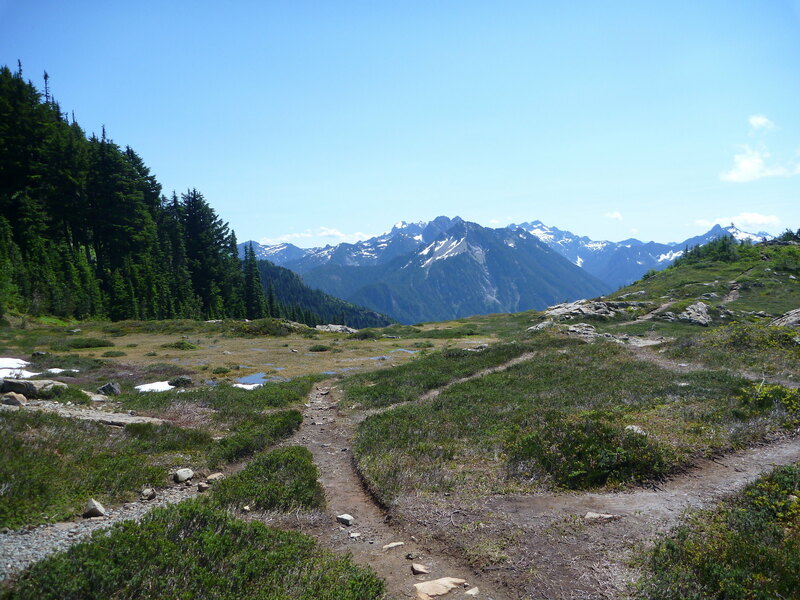 The trail is quite easy to find through the boulder field on the way to Headlee Pass at the head of the basin. This section was actually quite hot on this August day. The trail ascends steeply up a narrow gully to Headlee Pass. We didn’t see anyone close above us, but had there been, we would have donned the helmets for rockfall. 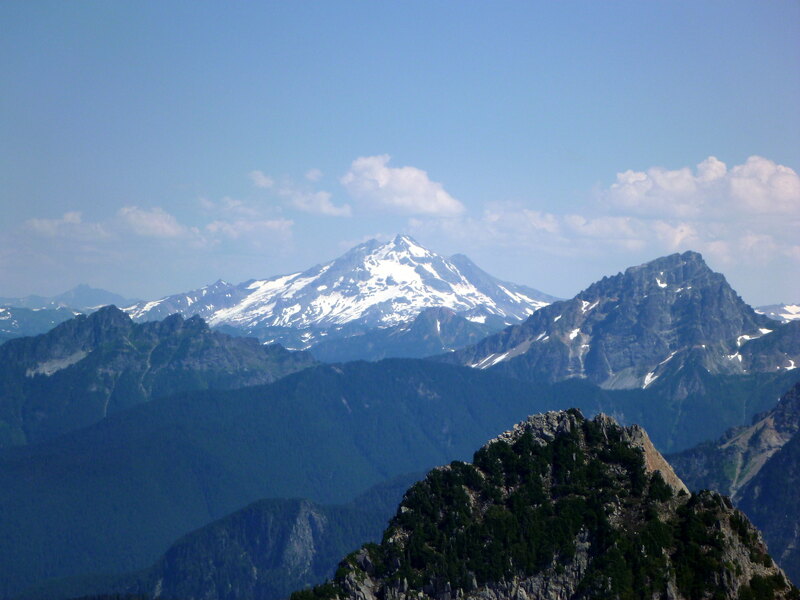 From the top of the pass, Vesper Peak is finally visible. Traversing the shoulder, it is not far from the pass to Lake Elan, in the basin between Sperry Peak and Vesper. 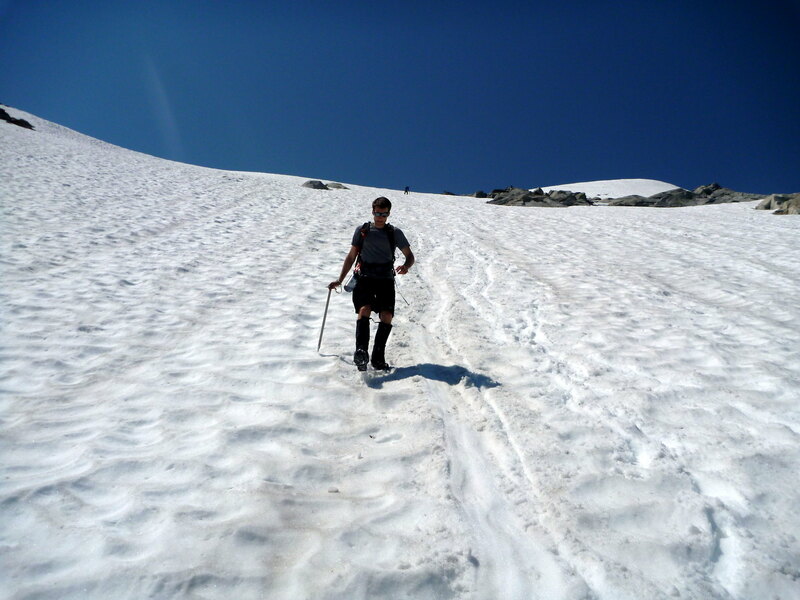 It was clear that we would have some snow climbing to do near the top. But first, the trail winds its way through a brushy meadow. Because of the snow melt, the trail is full of running water and slick mud (probably the only spot where we fell on the entire trip). We used axes instead of poles once we hit the snow; either would have worked, except that we ended up off route on 40 degree snow. 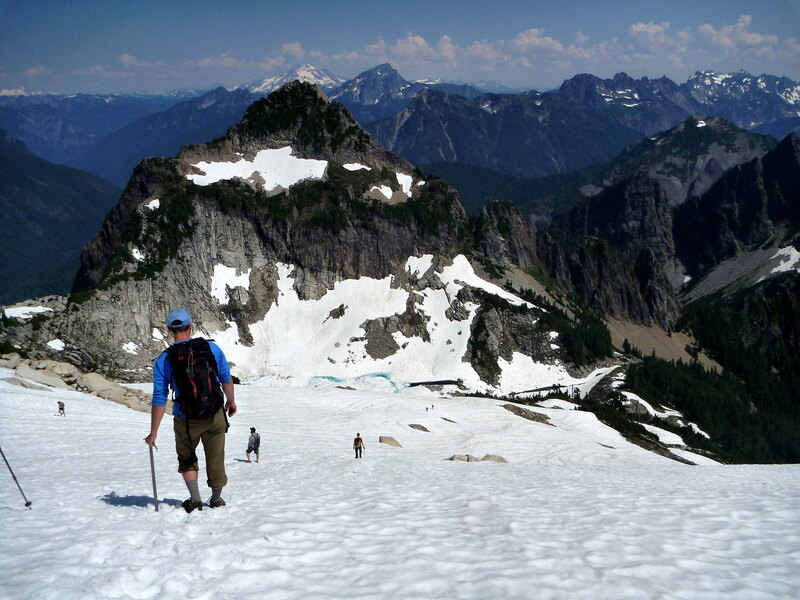 The surface was soft enough to kick steps in hiking boots, but it would have been a potentially fatal slip and fall down the snow slope onto the rocks below. 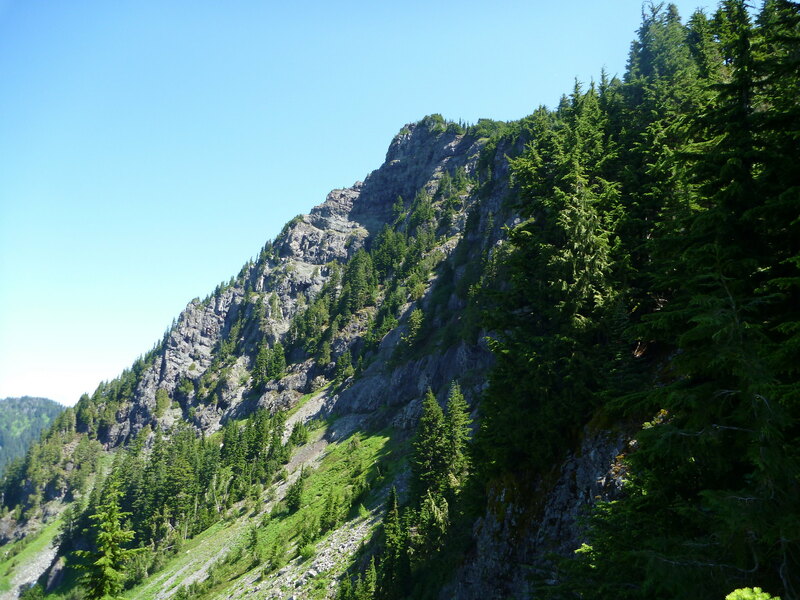 We should have traversed further left (foreground in the photo above) where some exposed rocks provide easier passage to the summit (wasn’t visible from our spot). A few more steps on the summit rock pile and we were there! 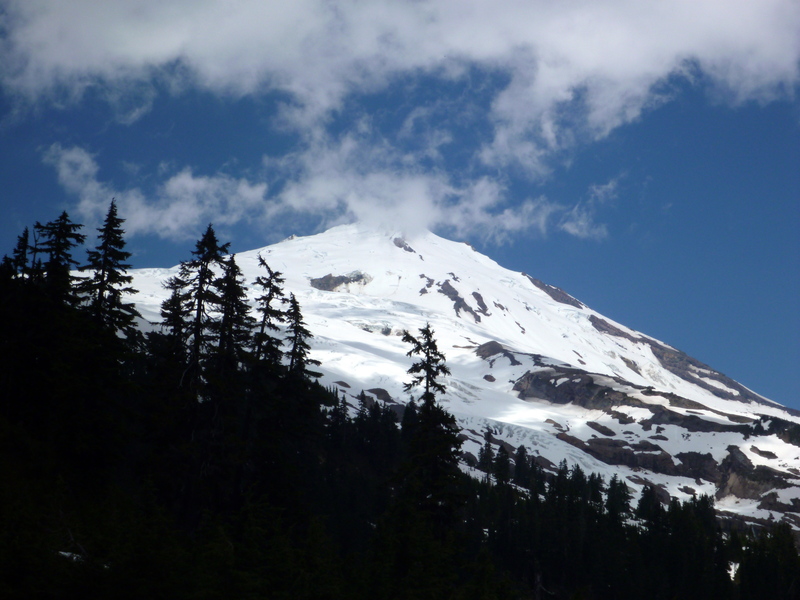 The summit itself is pretty pointy – not an easy one to stand upright on. 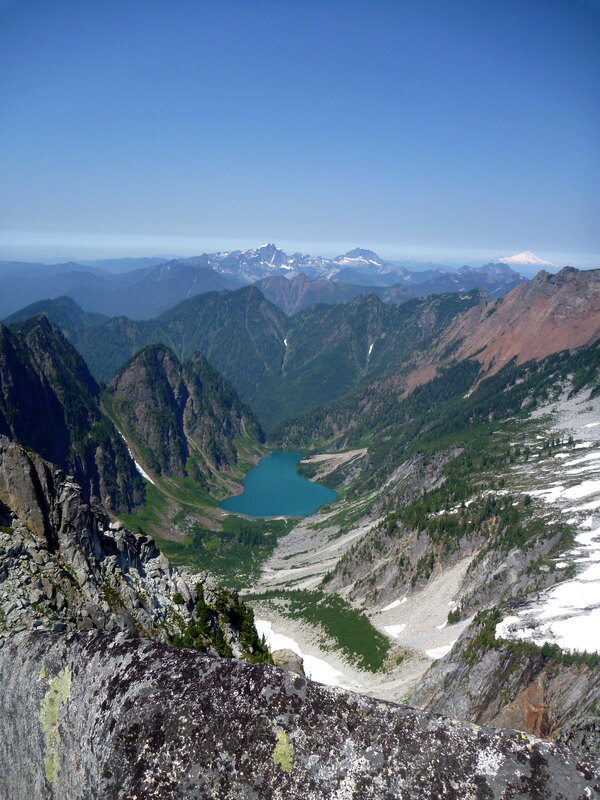 The view to the North and West is spectacular: an alpine lake bounded by steep walls and Mt. Baker in the background. 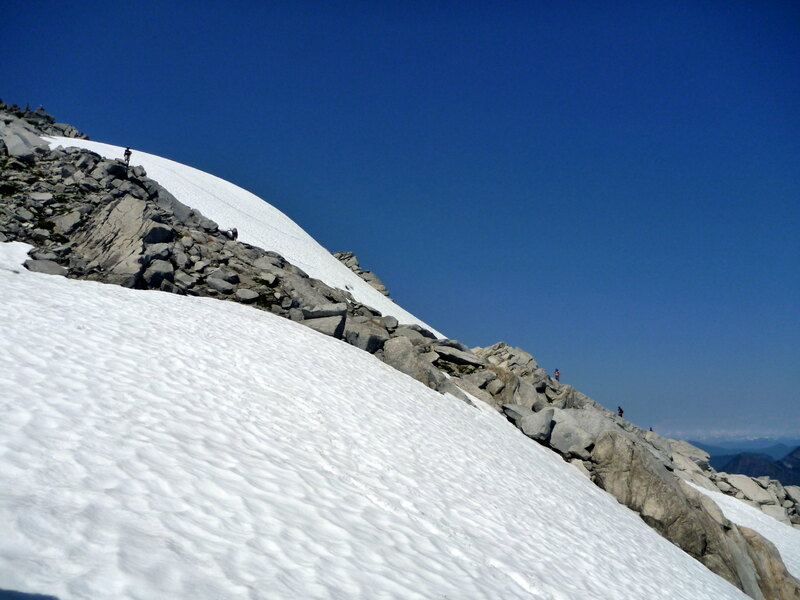 With all the rocks melting out, glissading would have been a poor move, so we heel stepped down the softening slope, avoiding the steep section from earlier. 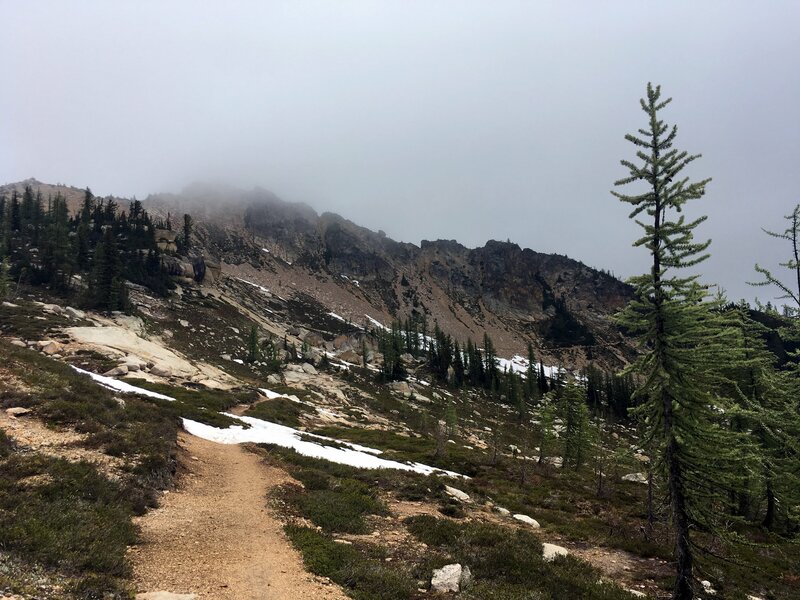 We had considered combining Vesper with Sperry Peak, but Sperry’s normal route was still covered with steep snow (visible in the above picture) with a horrible runout (at least spotted from afar – a slip would send you over the cliff). It’d be a nice excuse to say that’s why we didn’t attempt, but we were also not in a peakbagging mood. We elected to take it easy at Lake Elan before heading home. Good choice. 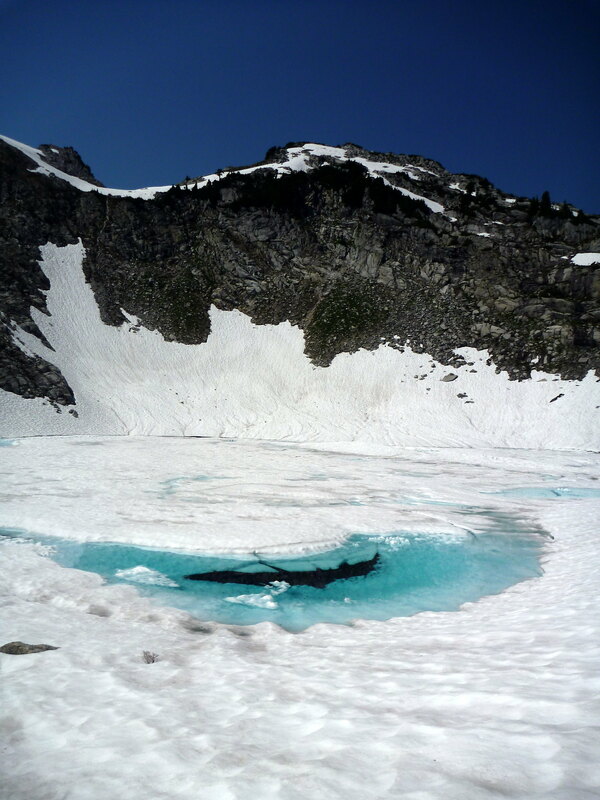 The mesmerizing blue ice of melting alpine lakes is one of my favorite features of the Cascades. 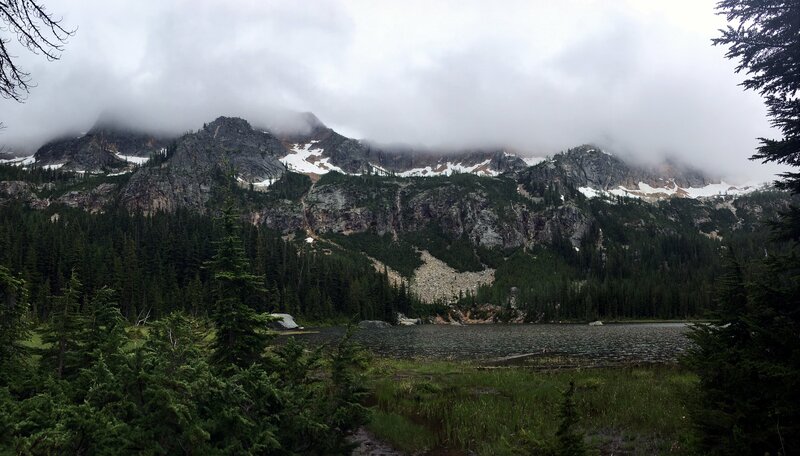 Good views on a physically challenging, yet very approachable trail. I did fall one time when I got caught up in some brush – even though the trail is nicely graded, it is pretty rugged for a trail run.